Unlock your Galaxy by IMEI without voiding the warranty. Method recommended by the phone manufacturer. Permanent unlocking service valid for all Samsung models. Safely unlock your Galaxy from the comfort of your home. How to unlock my Samsung phone with doctorSIM? To unlock your Samsung Galaxy all you need is your IMEI number and the name of the network carrier to which the phone is locked. We will scan multiple databases for your unlock code and then send you simple step-by-step instructions on how to complete the unlocking process. What is the difference between the Standard Service and Premium Service? Our Samsung Standard Service scans local databases and is our low-cost solution with a very high success rate. If your unlock code is unavailable after scanning local databases, we will issue you a full refund so you can use our Samsung Premium Service which scans databases located worldwide practically guaranteeing the availability of your network code. What is your Regional Service? If you purchased an unlocked Samsung Galaxy in another country, but nonetheless are prompted for a regional unlock code, we can send you this code via our Samsung Regional Service. This is an additional unlock code required for Samsung smartphones purchased in another continent. What happens if my Samsung's software has been modified? 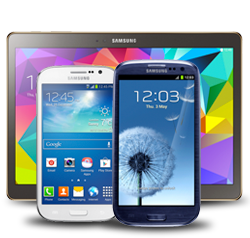 We guarantee our method of unlocking Samsung cell phones will work with all original software and future updates. Unfortunately, we do not take responsibility if the phone has been modified in any way. You will need to restore the phone to factory settings and assume the risks of having possibly altered key components of the phone's software required to successfully unlock it. Do I need a SIM card from my new network to unlock my Samsung Galaxy? Yes, one of the requirements to complete the unlocking process is to insert a SIM card from a different network. Without another SIM card, the cell phone will not prompt for the unlock code and unlocking the phone won't be possible. How do I proceed if I don't know the original operator of my Samsung Galaxy? You do not have to indicate the exact network to unlock your Samsung. However, if you need to know this information for any other reason, for example, before buying a second-hand phone, you can find out with our Samsung original carrier IMEI check. Do I have a maximum number of attempts to unlock my Samsung? Samsung phones do not have a maximum number of unlocking attempts. However, if the unlock code is typed incorrectly repeatedly the phone will 'freeze'. To remove this internal restriction, you will need to type in the Defreeze code (MCK code), which is included with our Samsung Premium Service, and then re-type the unlock code to unlock the phone. What do I need to unlock a Samsung device? All you need to unlock your Samsung Galaxy is an Internet connection and an e-mail address to receive your unlock code and step-by-step instructions. It is important to type the unlock code after typing your PIN and when the cell phone prompts for the unlock code. You can also use our Samsung phone blacklist check to see if the phone has been blacklisted due to loss, theft or non-payment. We are a registered business. You will be able to use your Galaxy with any network carrier. Your Samsung's warranty remains valid. You can continue to use your cell phone as normal during the unlocking process. Permanently unlock your Galaxy without leaving your home or office. Fast unlock code turnaround (within minutes to a few hours). Simple step-by-step instructions and tutorials delivered 24/7.